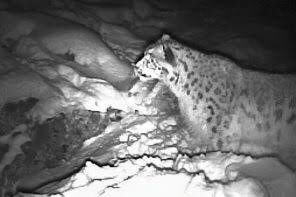 A snow leopard was captured on camera in Lahaul-Spiti’s Miyar valley, making it the first instance when the elusive big cat was spotted below the tree line. Shiv Kumar, a wildlife photographer and forest guard posted in Lahaul, had set up camera traps in the valley before the onset of winter, according to a report by The Tribune. The camera recorded the footage of a snow leopard chasing a pack of ibex near Udaipur, around 3 km towards the Miyar valley. “I had installed two trap cameras in the area before the onset of winter and this year the district received a heavy snowfall and I could reach my trap camera on Friday. Exploring the files, I found a one-and-a-half minute footage, where some ibex were walking past the camera. Suddenly, I saw a snow leopard chasing them. The footage was recorded on January 16 this year,” said Shiv Kumar. According to Shiv Kumar, he had been trying to catch the snow leopard on his camera since year 2010 and finally he got it. The snow leopard is generally found above the tree line and prefers to stay alone. This year due to heavy snowfall in the area, wild animals came down to lower area in search of prey, The Tribune reported. During the winter season, the wildlife department becomes extra active as descending of animals trigger man-animal conflicts. The department enhances its patrolling to check the poaching of animals. However, experts are unable to count the exact number of snow leopards as they change their territory every day. Posted in Happy News, News and tagged camera traps, india wildlife news, jammu and kashmir, ladakh, lahaul-spiti, leopards, man-animal conflicts, snow leopards. Bookmark the permalink.